As a follow-up to Daniel's visit to the Club, some members attended the official opening of the living accommodation on Saturday 24th June. A large representation from Clubs throughout Ireland met at the hospital and were welcomed by Sharon Hayden who is Director of Operations. Outlining the project, Sharon advised that the hospital opened in 1956 and caters for children from North and South. The hospital has 10,000 inpatients per year, and also deals with 80,000 out-patients and 18,000 day cases per year. The accommodation block was old and weary and not suitable for parents and families who had children seriously ill in the hospital. The aim was to develop the bedrooms into hotel style rooms making them more comfortable for them to stay in. The project was pioneered by Daniel with the support of DG Declan Tyner and Rotary Ireland. 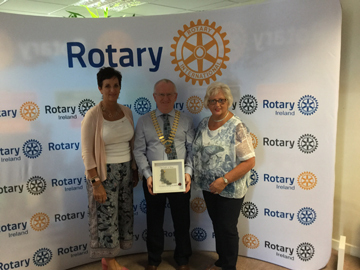 DG Declan informed the group that the project started eighteen months ago, once Rotary Ireland became aware of the project and the fact that it covered all Ireland they came on board. Funds were raised by Clubs and the final part of the project involved fitting fireproof doors to all the rooms, this work was carried out by a team of volunteers over two days. This certainly lived up to the Rotary Motto - Service Above Self, Declan thanked Daniel for sharing his dream. 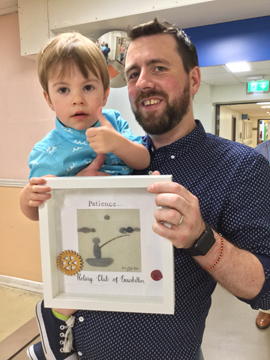 Daniel shared a short video of the project and the benefits to the hospital, and thanked all the Clubs associated with the Project, in particular Assistant Governor Seamus Walsh and Monaghan and Newbridge Rotary Clubs. 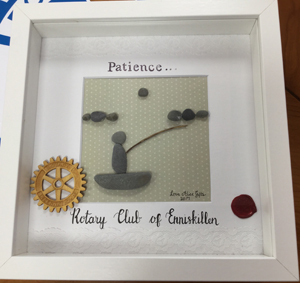 The Rotarians present were given a tour of the accommodation block and each club was shown an Art piece with the Club name on it, which will be placed in each bedroom. Congratulations to Daniel for his planning and involvement in this project, it was also very appropriate that he was awarded a Paul Harris Fellow award at the recent Monaghan President's night.